Some of my favourite games from the 1990s were building and resource management simulators. Civilization is probably the most recognizable name in my collection of favoured classics, but there were others such as SimCity, SimAnt and Rail Road Tycoon. My point is, I like sandboxes where I can build things. I also like a little competition or struggle in my simulations. For example, I like that in SimAnt there are other ants running around that might destroy my precious colony. I like that Civilization pits other nations against the player. SimCity, without the monsters and earthquakes, would be about as exciting as managing a spreadsheet. Enter CaesarIA, a game that feels very much like the original SimCity urban building simulation, but with a Roman Empire theme. Our job is to set up houses, build guard posts, create roads, build temples, create farms and place markets. Ideally, if we do everything correctly, we will have a growing and prosperous village. If we do not lay out our village correctly, then we face worker shortages, fires that will spread from building to building and angry deities. The game also warns that we must appease Caesar with tributes if we want to keep our job. There is the motivation, the stimulation in the simulation. There are fires and angry emperors to guard against if we want to retain control of our town. 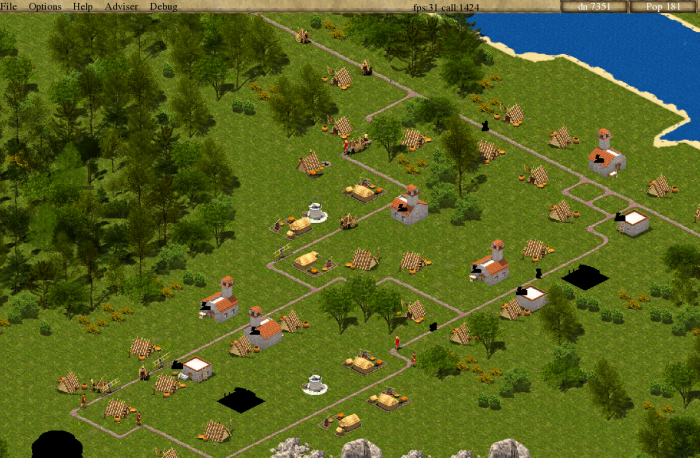 CaesarIA has a nice, simple interface, similar to the original SimCity. There is a control panel where we can select which buildings, services or roads we want to construct. We have a tool for clearing an area of buildings or trees. As we shape our village, little pop-ups appear letting us know if something demands our attention. For instance, if a building burns down a notice might appear letting us know and warning us we should build more wells to provide water. Placing a market too far from a road will cause a message to display that we need to connect the new building to existing roads. If we are short on workers, the games tells us we need more houses and so on. At this time, the game is very much in its early stages, what I played with was not a finished product. The game is currently missing some images (a few buildings appear as just black boxes), some features like talking to advisers do not work yet and there are some text strings missing or not yet fully translated. The game has one developer (so I’ve read) and CaesarIA is being actively worked on and fleshed out. I played a few scenarios of CaesarIA and these are my initial impressions of this early release. First, the game is pretty friendly. The controls are simple and each mission starts with a clear set of goals. We need to grow our population, or we need to produce a certain about of food, things of that nature. The tips that appear during the game are helpful for maintaining a healthy city. For instance, we are told when we need to build more houses, roads and so forth. However, there are a few problems. As I mentioned, some features and artwork haven’t been completed yet. I also ran into a problem in one early scenario where my town kept getting destroyed by invading soldiers and I couldn’t find a way to stop them. I tried restoring my game and building guard posts, I tried building temples to the god of war, I tried to find a way to appease the Caesar for protection. Sadly, I couldn’t find anything that would repel invaders and, each time I played the scenario, my town was overrun by enemy soldiers. Based on what I know of the game’s inspiration (https://en.wikipedia.org/wiki/Caesar_III Caesar III), I suspect there is a missing feature that would allow me to create defences. What it comes down to is CaesarIA appears to be doing a good job of recreating Caesar III for modern operating systems. The style of the game, the graphics and animations, feel appropriate to a 1990s creation. (Or a retro clone.) At the moment, I quite like the style of the game, the goals and the interface. There are some pieces missing, but I suspect those will be filled in over the coming months. CaesaeIA may not be ready to play yet, but it is getting close and I’m going to keep coming back to check on this game as I feel it has a lot of promise.